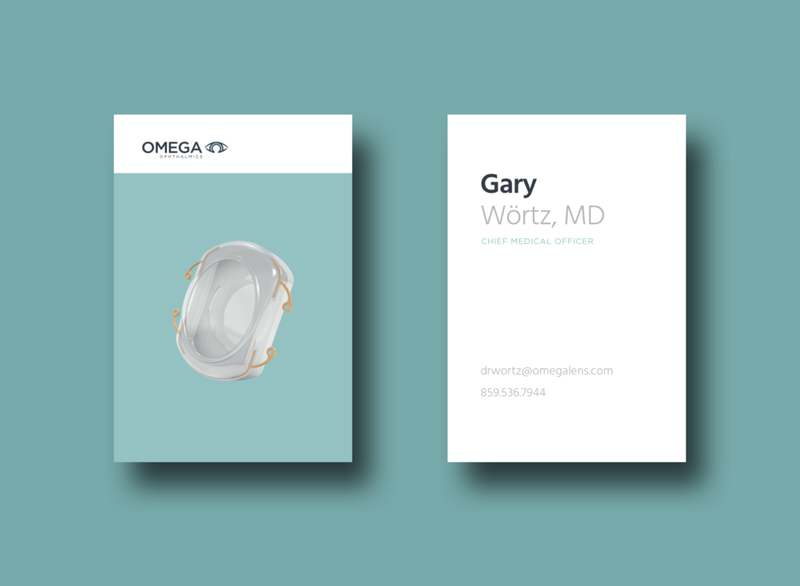 Omega Ophthalmics needed a fresh face for their website and marketing to publicly reveal their new intraocular lens for the first time. We helped Omega create a brand new website, promotional video, and marketing materials that helped reveal their novel technology to the world. Omega Ophthalmics had operated in "stealth mode" for the past five years as they developed the design for their proprietary intraocular lens. Because the design was so novel, Omega needed to fly under the radar and not give too much information away. While Omega had a website, it didn't contain many concrete details about their device. There were no photos, no patent information, and only some information about what the new lens was and what it could do for ophthalmology. But Omega's story was much larger than that – their IOL is not only groundbreaking for ophthalmology in that it can control the X, Y, and Z-axes and keep the capsular bag open, but it has a variety of potential applications in other markets, including pharmaceuticals and virtual, augmented, and mixed reality. The challenge for Omega was deciding how much to reveal - from photos to technical details, patent grants, and more. Omega received several patent grants during the website design process, so including technical details and photos of their design was key to their public reveal. The reveal itself wasn't so simple, as Omega had a variety of audiences – ophthalmic, pharmaceutical, and high-technology. As such, we needed to craft a unique story for each of these audiences, as the Omega lens has a very unique application for each industry. Messenger helped Omega with their reveal strategy, which included a new website to showcase their IOL appropriately and consulting on their business goals. At the end of the day, Omega needed to present their device to the world, all the while framing their story appropriately to their many audiences. While this wasn't an easy task, we settled on a new website that clearly presented the specific applications of the Omega lens to its many audiences and a promotional video that could encapsulate the entire Omega story in a few minutes. We worked directly with Scientific Animations to storyboard and produce an animated short video to explain the Omega lens to the ophthalmic, pharmaceutical, and high-tech industries alike. The design of the Omega lens itself was key to the creation of the website – we wanted the simplicity of the website to complement the simplicity of the IOL itself. Creating a high-resolution image of the Omega lens was key. Scientific Animations came up with a high-resolution, three-dimensional image of the Omega lens that would become the cornerstone of the website and marketing materials. Omega was finally ready to reveal their technology to the world, and we weren't going to leave anything out. We designed a website that clearly presented their IOL design and framed their story appropriately for each audience. 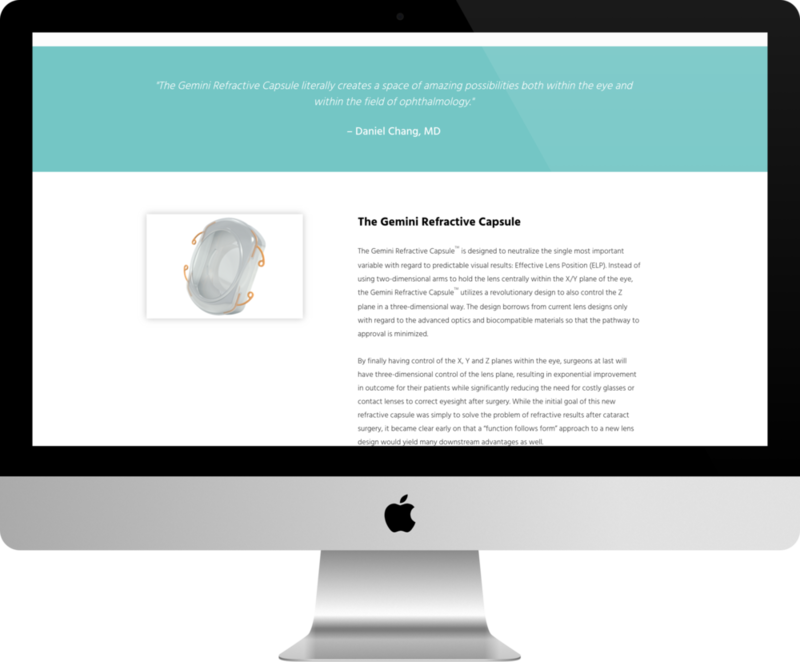 Key to this new website was better showcasing testimonials and quotes from Omega's Medical Advisory Board, a group of well-respected physicians whose words lent social proof to Omega's new technology. Another key was showcasing Omega's progress throughout the years, including animal trials, human trials, and major intellectual property events. Omega currently enjoys intellectual property coverage from over 17 granted patents in several patent families, as well as successful animal and human trials. In order to properly tell the Omega story well, presenting this information in an easy-to-digest format was key. Since the new Omega website incorporated new design language and photos of the actual lens, we created new business cards and marketing materials for Omega to present a consistent, cohesive brand across all touchpoints. This included the creation of Omega apparel for key company leaders to wear at industry networking events and speaking engagements. By redesigning their website and having a promotional video, Omega was able to showcase its lens and get industry players interested in its technology. Before the new website was created, news of Omega's new lens was word-of-mouth only; now, their "reveal" and new marketing materials have attracted major interest from key parties in the ophthalmic, pharmaceutical, and high-technology industries. Omega is continuing to inform the public and applicable industries about its new lens through public relations, investor relations, and a variety of speaking engagements and industry presentations, but they credit the new website, promotional video, and marketing materials as helping them get their story out into the world. Interested in a new website that's custom-made to attract your audience? Contact us today for a Free Website Report.